Interesting selection to spend some time swimming in Oberhaching. Is it not your first time here? Tell us how it went using the Facebook comments beneath or contacting us directly! 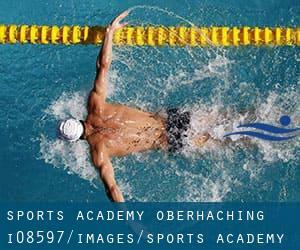 Sports Academy Oberhaching is only one of all of the swimming pools Swimia is offering you, and its info has been shared with us by a swimmer like you.Bear in mind you can now promote Sports Academy Oberhaching by sharing this page together with your pals, adding comments and linking to us. This sports center offers 25 meters x 12.5 meters, Indoors. Contact information for this Swimming Pool for instance phone number and email address are number. Write down the GPS coordinates we have on our file for this Pool, so you can enter them into your GPS to help you locate the Aquatic Center easily. If you believe that any in the details is incorrect, please get in touch with us. Aid us be better day-by-day. Updated on 2019 Seeshaupter Straße 24 , Penzberg , GERMANY (Postal Code: 82377). Among all the activities supplied by the center, if you are interested in swimming you will enjoy 35 meters x 14 meters, Indoors. Just in case you want to contact this Pool before dropping by, we only know the phone number. Updated on 2019 Jochamstrasse 12 , Freising , GERMANY (Postal Code: 85354). Swimmers like you reported 25 meters x 12.5 meters, 1.4 meters-2.3 meters depth, 1.4 meters-2.3 meters depth, Indoors. Unfortunately we do not have the e-mail address of this Swimming Pool, but we can give you the phone number. Updated on 2019 Stemplingerstraße 2 , Rosenheim , GERMANY (Postal Code: 83022). Swimmers like you reported 25 meters, Indoors. Phone number and e-mail address are number for this Swimming Pool. Updated on 2019 Waldluststraße 6 , Haar , GERMANY (Postal Code: 85540). This sports center offers 25 meters x 12.5 meters, 0.3 meters - 1.8 meters depth, 0.3 meters - 1.8 meters depth, Indoors. For this Swimming Pool, only phone number is number here. Updated on 2019 Jahnstrasse 6 , Geretsried , GERMANY (Postal Code: 82538). This sports center gives 25 meters x 12.5 meters, 1.8 meters depth, 1.8 meters depth, Indoors. Contact information for this Pool for example phone number and email address are number. Updated on 2019 Kãthe-Winkelmann-Platz 4 , Neufahrn bei Freising , GERMANY (Postal Code: 85375). Swimmers like you reported 25 meters, 5 lanes, 0.8 meters - 1.3 meters depth, 0.8 meters - 1.3 meters depth, Indoors. Phone number and e-mail address are number for this Swimming Pool. Updated on 2019 An der Rottauer Straße , Bernau , GERMANY (Postal Code: 83233). This sports center offers 25 meters, 3 lanes, Indoors. For this Pool, only phone number is number here. Updated on 2019 Leopoldstraße 1 , Muehldorf , GERMANY (Postal Code: 84453). Swimmers like you reported 25 meters x 10 meters, Indoors. Phone number and e mail address are number for this Swimming Pool. Updated on 2019 Postillonstrasse 17 , Munich , GERMANY (Postal Code: 80637). Among all the activities supplied by the center, if you are interested in swimming you might enjoy Olympic size, 8 lanes, Outdoors. If you'll want to contact this Swimming Pool, email address and phone number are both number. Updated on 2019 Kreillerstraße 215 , Munich , GERMANY (Postal Code: 81825). Swimmers like you reported 25 meters x 10 meters, Indoors. Phone number and e-mail address are number for this Swimming Pool. Updated on 2019 Südliche Ringstraße 63 , Ingolstadt , GERMANY (Postal Code: 85053). This sports center offers 25 meters, 5 lanes, Indoors. Contact information for this Swimming Pool for instance phone number and email address are number. Updated on 2019 Wilhelminastrasse 5 , Bad Wiessee , GERMANY (Postal Code: 83707). This sports center gives 25 meters x 12.8 meters, Indoors. For this Swimming Pool, only phone number is number here. Updated on 2019 Landrat-Müller-Hahl-Str. 15 , Kaufering , GERMANY (Postal Code: 86916). Among all of the activities supplied by the center, if you are interested in swimming you will delight in 25 meters, 4 lanes, Indoors. If you should contact this Swimming Pool, e-mail address and phone number are both number. Updated on 2019 Hans-Keis-Straße 59 , Pullach im Isartal , GERMANY (Postal Code: 82043). Among all the activities offered by the center, for anybody who is thinking about swimming you will delight in 25 meters x 12.5 meters, 5 lanes, 1.2 meters - 2 meters depth, 1.2 meters - 2 meters depth, Indoors. If you need to contact this Swimming Pool, email address and phone number are both number. Updated on 2019 Dammarkstraße 6 , Mittenwald , GERMANY (Postal Code: 82481). Swimmers like you reported 25 meters, 5 lanes, Indoors. Phone number and e-mail address are number for this Pool. The information and facts of this Swimming Pool has been verified lately by a member of their staff.